Religious Studies majors at Hellenic College learn about the Orthodox faith in a community of fellow Orthodox Christians living, studying, working, and worshiping together. They also learn to be sensitive to and conversant with major philosophical and theological positions in the study of religion. Through a broad survey of biblical studies, Christian theology, and religions, students come to appreciate their own Orthodox Christian faith intellectually and spiritually. Religious Studies provides students with critical thinking and writing skills while also preparing them with analytical and research skills. Many students continue on to graduate studies in religion or theology. As the school is a vital center of activity for Orthodox Christians, students also study with some of the finest Orthodox scholars in the United States. Students form close relationships with graduate students of Holy Cross Greek Orthodox School of Theology and employees of numerous Church ministries on campus, and they are introduced to a world of opportunities for missions and service. 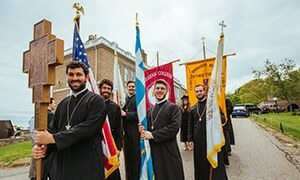 Hellenic College Religious Studies majors grow in the faith, history, and cultures of the Orthodox communities that they serve and lead after graduation. Students on the seminarian track also qualify for an accelerated program toward their Master of Divinity degree at Holy Cross.